Tinago Falls is a waterfall in Iligan City, Lanao del Norte in the southern Philippine island of Mindanao. 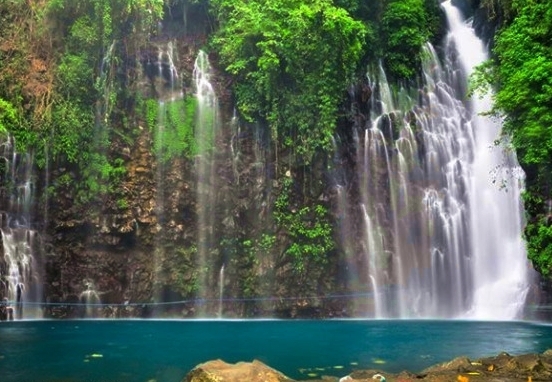 It is one of the main tourist attractions in Iligan, a city known as the City of Majestic Waterfalls. Tinago is a Filipino term meaning "hidden," as the falls are hidden in a deep ravine. Trekking to the falls requires approximately 500 descending steps called the Winding Staircase. The falls is high and plunges 240 feet (73 m) high from a cliff, its very cold waters cascading beautifully into a deep and calm basin-like pool which appears like a blue-colored lagoon. Under the falls is a small cave where people can enter and listen to the rumbling waters. Legend has it that there once lived an influential and powerful Sultan Agok and his wife. They were appointed by their people as their king and queen, but they became too proud of themselves and became selfish rulers of their kingdom. When the sultan's wife was pregnant, an enchantress, disguised as a beggar, begged for their help but instead they exiled and rejected her. Because of this, the enchantress cursed the couple that the child will become ugly but they did not take it seriously and permanently banished the enchantress. The child did become ugly. The couple was sad and disappointed, expecting the baby to be as lovely as her mother. They hid the child in a cave to avoid embarrassment and named the baby Tin-ag, which means "hidden face." They visited and took care of the baby in the cave. When the child grew up, she came out of the cave and became amazed at what she saw. The enchantress, who cursed her parents, saw her and made an offer to transform her into something of great beauty and splendor. She accepted the offer and became the Tinago Falls. Tinago Falls is located in a deep ravine in Barangay Ditucalan, Iligan City. From Cagayan de Oro Airport, get a taxi (to take you direct to Iligan), or get a taxi to drop you off at Bulua Bus Terminal (Cagayan). At Bulua Bus Terminal, you can find buses going to Iligan. Travel time from Cagayan de Oro to Iligan is approximately one-and-a-half hours.